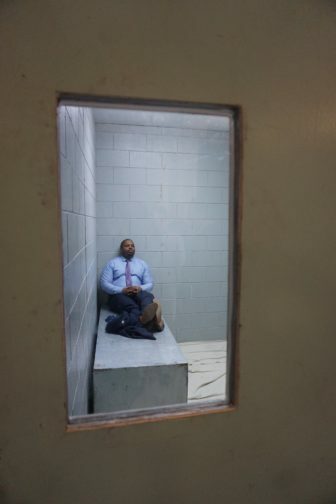 Sen. Gary Winfield in solitary – in the lobby of the Capitol. The door of an isolation cell rolled shut Tuesday behind Sen. Gary Winfield, D-New Haven. He stretched out on a hard bunk under a fluorescent light. But his stay would be brief. The cell that held him was a replica assembled in the ornate lobby of the State Capitol, not one of the state’s prisons. Instead of battling correction officials, opponents of long-term solitary confinement praise them for working in recent years to narrow the use of administrative segregation, as disciplinary confinement is known here, while reducing incidents of assault, suicide and use of force. David McGuire, the executive director of the American Civil Liberties Union-Connecticut, said Commissioner Scott Semple and his predecessor, James Dzurenda, each tightened criteria for the use, duration and nature of administrative segregation, where hundreds of inmates once routinely were confined on any given day. McGuire said the same disciplinary record — none of Tucker’s infractions as an inmate involved violence toward staff or inmates — would not land an inmate in administrative segregation today. Karen Martucci, a spokeswoman for the Department of Correction, said administrative segregation remains an important tool in maintaining order, but the department has changed and constantly reviews the standards for its use. Winfield, a member of the Judiciary Committee, said the proposed legislation would not impose further limits on the use of administrative segregation, but it would standardize current regulations and ensure the continued collection of data about its use. Sen. Paul Doyle, D-Wethersfield, co-chair of the committee, said he had heard from correction officers nervous about legislative limits on administrative segregation, but the bill would be drafted to reflect the department’s current policies. Edwin Cay, a member of the executive board of Local 391, a union that represents correction officers in northern Connecticut, was among the visitors who stopped by the replica cell and read a solitary confinement fact sheet on display. He said the department already meets evolving industry standards, which used to allow for confinement 23 of every 24 hours. It is now 22 of 24 hours. Cay said it is now used only for inmates who are violent towards themselves or others. “We have to have a place to put them,” he said.